Across the street from DART's Mockingbird station. Select from Knife's seasonal menus or from a variety of private dining menu options for most any occasion, whether a special dinner gathering, bridal shower brunch, cocktail party or corporate event. With Knife restaurant, 3 time James Beard-nominated and “Top Chef” contestant John Tesar brings a fresh, new steakhouse dining experience to The Highland Dallas. 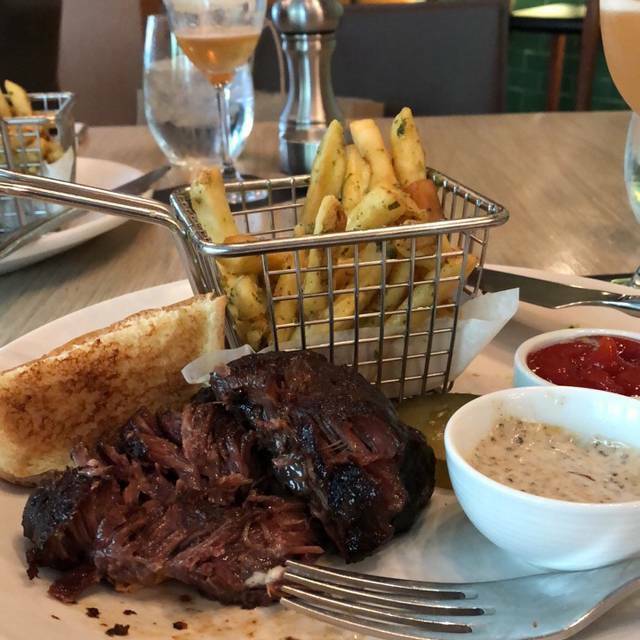 The menu features all-natural born and raised Texas meats, complementing “old school” classics like 45-day dry-aged sirloin and bone-in rib eye with “new school” evolutions that include culotte and flat iron. In addition to larger “slabs” of meat for group dining — including an 18-hour braised crispy pig’s head — the menu is rounded out by an extensive charcuterie program, bacon and ham tastings, sausages, sandwiches, salads and pasta dishes. In addition to a sophisticated dining room, Knife offers a flagstone garden patio with a fireplace. A private dining room with its own lounge and fireplace is available for special events. Knife was recently named “Best Steakhouse” by D Magazine and named "Best New Restaurant 2014" by Esquire Magazine. Celebrating wedding anniversary. Excellent service all around. Sommelier helped us pick an outstanding wine at our price point. Salad and bacon sampler were great. 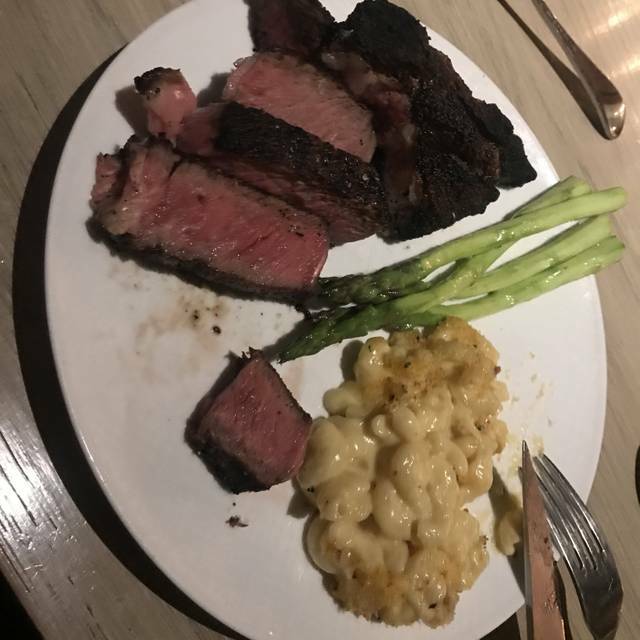 It was our first time sampling dry aged ribeye and we probably wouldn’t do again. Excellent flavor but fattier than we typically want and not as tender as expected. Would try the sirloin next time. Fun desert was provided on the house. Food was fantastic, servings large. We three easily shared a 32 oz steak and it was ample. Bacon sampler is very good. Service was superb. Highly recommend. The food was fine (but not fabulous) and the service from beginning to end was really great but I felt that it was more expensive than it should be. The final bill was over $360 + 70 tip for four adults (included a bottle of wine and 4 cocktails, two shared salads and two tuna entrees, two steak entrees and side orders since none are included with the entrees). The food was great and we had a great time. The bar was pretty busy and a lot of noise for the basketball game that was on. I was just surprised that at the beginning it resembled a sports bar which is not what I was expecting for a $350 meal. But the bone in ribeye couldn’t be beat! Chic, delicious , and fun. Best steak au poivre I’ve ever had. Some confusion with the reservation , but they totally handled it graciously. Anyone going to Dallas should have dinner at Knife! We ordered the 32oz prime rib 45 day dried.. highly recommended!! Amazing food and service! 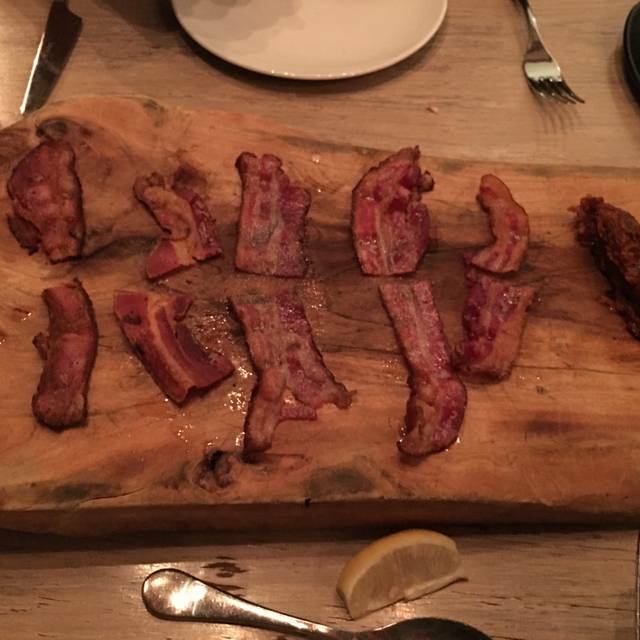 We started out with the Bacon Sampler. It is a must if you enjoy bacon. There were 5 different varieties to try. My husband had the 10 oz. filet mignon with Au Poivre sauce. It was cooked perfectly and had a wonderful flavor. I had the 10 oz filet mignon and it was perfect. These steaks were both from 44 Farms; we love that they use only Texas meats. They also surprised me with a dessert for my birthday! We will definitely we going back. Knife was a good experience, and the steak was about as good as advertised. The service was prompt and courteous, going on a Monday decreased the competition for our server's attention. Cocktails were good, wine list was expansive if a little ridiculous for the mid-range wine selection. I get trying to aim for the upper range, but the mid-range was sorely lacking. Appetizer (tuna and foie gras torchon) was OK. Presentation was odd with a massive circle of tuna overlaid on an upjumped foie gras cracker. Well-complemented but could use more acid. Steak was great and worth the >$100 tag. Perfectly cooked between rare and mid-rare, flavorful. Creamed spinach side was amazing, brussels and cauliflower less so. Dessert was on the house and semisweet, which was nice for the fiancee. Coffee was fantastic (and cheaper than starbucks!). This place was good but I wish we'd found something more anniversary-appropriate. Better for a casual nice dinner or business junket/happy hour. Nice experience but we won't be going back for our anniversary. I was visiting my son who is attending SMU. The gentleman at the front desk of the Lumen recommended Knife. We had a fabulous experience. I was especially excited to know that it is owned by a Top Chef contestant. I’m on season 13 currently. Now I am even more looking forward to watching Season 14-Top Chef Dallas!! We arrived early and were taken early which was terrific. Service was brisk and our orders were taken quickly. The food was terrific except.......I ordered the lamb (at $68) medium and it arrived rare. I hate sending back meat because it interrupts and can ruin your whole dining experience while everyone either waits for your food to return or they all eat, you don't and then everyone watches you eat. I decided to eat it anyway except for the blood rare parts, so the entree was not all that enjoyable. At this price point, a restaurant needs to know how to cook a piece of meat. Most steak restaurants ask you to cut into the meat so they can ensure it is cooked right. Knife did not. I did complain and they were apologetic and gave us a free dessert. Other than my issue, the dinner was delicious. Lamb meatball sauce was cold and steak was more like a rare than medium rare (it is ok) and steak is tasteless (more serious). I ordered the exotic Japanese steak, really not good. Maybe Traditional ribeye is better. Waiter was nice offering free desert as an apology. My only criticism: I get that this is a high end restaurant. And I don't mind paying extra for the wonderfully delicious food being served there. But $27 for TWO small cocktails? (A Bloody Marry and a margarita) Come on, that's a little over the top. Even for this place. The restaurant is very worn...seating needs to be replaced. I was afraid the torn seat covering would ruin my suit :-/. Food was ok. Not great, not bad. But the noise level was low which was good for a business lunch. One of the best dinners I have ever had in Dallas. Good steak but we failed to see John Tesar's vision on a "modern approach" to steak in a city filled with others doing the same (and more successfully too). Some fancy cocktails, an iPad wine list and a chilled veggie crudité is a nice.gimic but does little everyone is elevate prices. Cut to subpar service with absolutely no personality, wilted garnish that serves no purpose on the plate (sprig of Rosemary shoved into a shallot that sat under a heat lamp for hours) and you end up with mediocre at best. 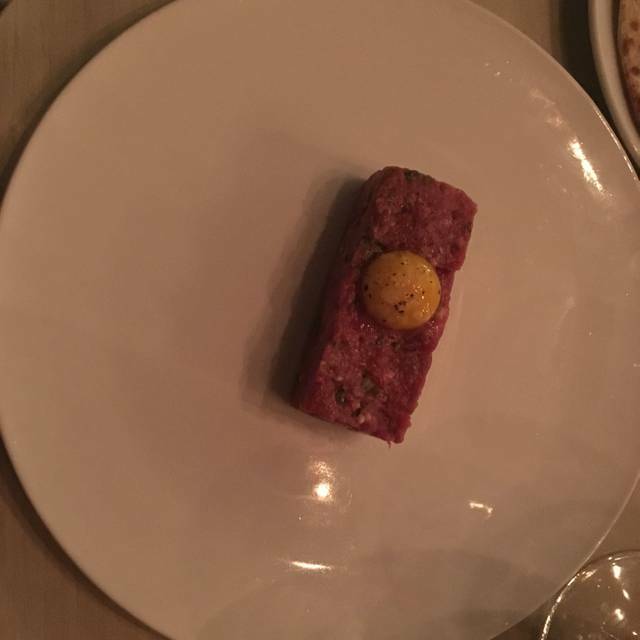 Oh and avoid the steak tartare, it looked ground rather than chopped which gives it a raw hamburger consistency. The mustard was also overpowering (I think it was English rather than Dijon). Save your money and have a nice drink in the bar on your way to another restaurant. They were all out of ribeye which is why we went. Disappointed for a steakhouse. We loved going to this place for the first time as we have been talking about it for over 2 months. Went there expecting to spend a lot but everything was reasonably priced well. 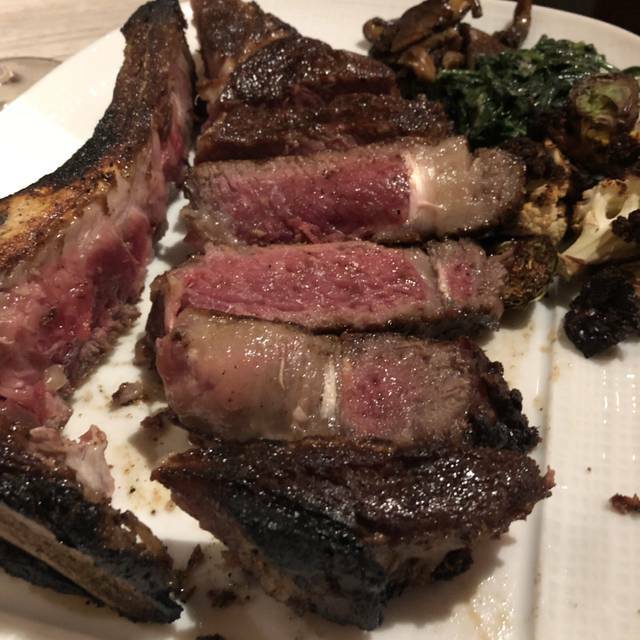 We had to order the 45 dry age 32 oz bone in ribeye and it exceeded our expectations! It’s worht the money way to invest in a great cut, taste, and tenderness of the steak. Also had a burger(cause the steak was more for me) and had a couple of sides as well along with the delicious dressing/dip for the crudité was amazing and I wish I could have a bottle of that! Bread was spot and got two servings of that. The sorbet was also amazing and it was a great experience overall. It was wonderful and gave a very boutique feel which we loved. 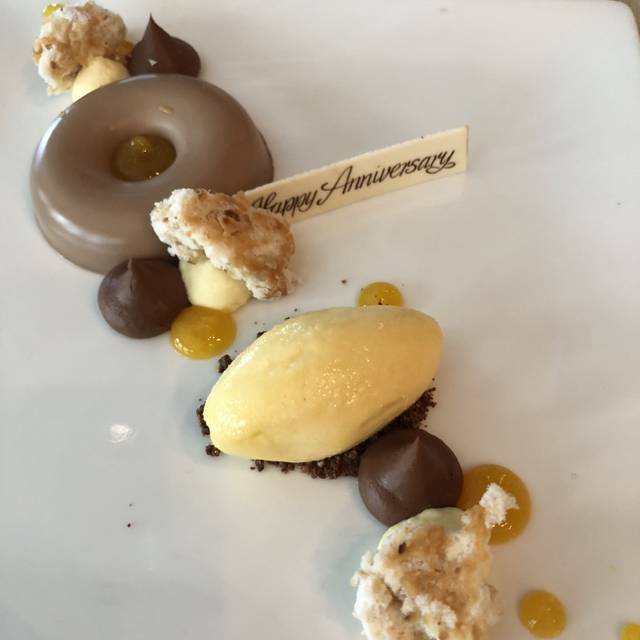 Only thing was that they didn’t fulfill the request when I reserved was the fact I asked for a special congratulations desert for my boyfriend’s new job/promotion. Either way, the entire dinner was worth it. Will go back again for sure! Best steak I’ve ever had in my life! When making the reservation, the only seating available was at "the counter" and I was a little worried that it wouldn't be great seating, however, it was perfect for us and I would highly recommend for a party of 2! We were able to see the different meats and how they were prepared. The service was outstanding, as was the food! Next time in Dallas, I will be going back! Knife rarely disappoints. Delicious filet, drinks, appetizers, and ambiance. We’ll be back. Need a new vent hood. Very smoky. Menu underdeveloped and over-expensive. Waitstaff and greeter and manager were great. I was working on homework since I’m a student at SMU. I find Knife as a pleasant place to work and eat and relax from the tensions of being a student. There are unique items on the menu and the preparation is on point. Service is good from wait staff to Sommelier. The ambiance could be improved as the tables feel very hotel-restaurant-ish. It is also rather loud, and the prices are pretty high compared to other restaurants for what you are getting. 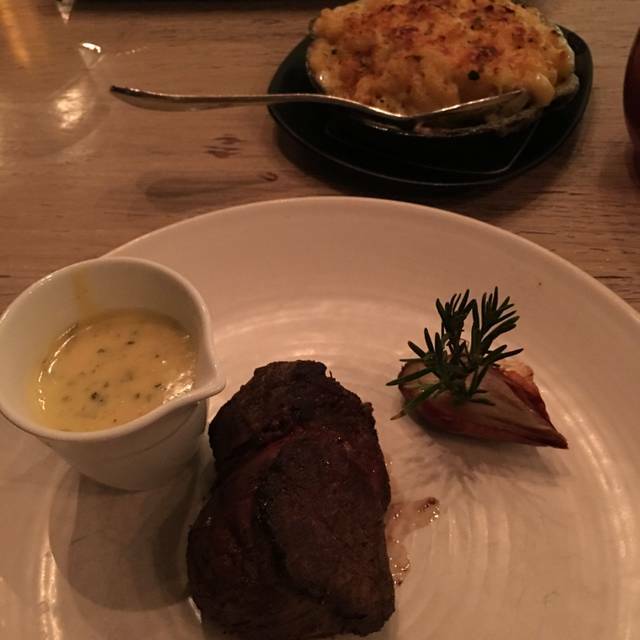 Food was good, not great, same for the service — I expected more? Doesn’t mean it was a bad experience, just not what I expected of the supposed #2 steakhouse in Dallas! Great service. Ben was helpful with wines as always! It was great had a 90 day dry aged Ribeye that was wonderful and the best salads we have ever had!!! 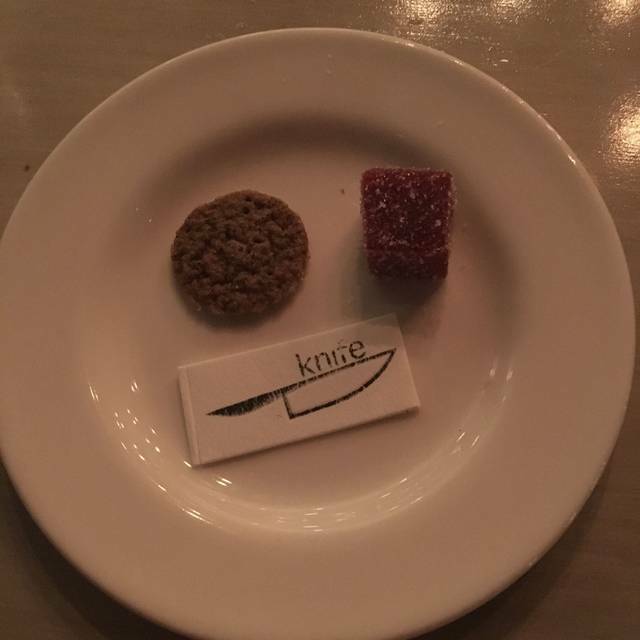 I was expecting a fine dining experience, but Knife is really a traditional "hotel restaurant" in its set up. The steaks are, indeed, fantastic. But when you are spending $100 on a steak, and more than that on wine, one expects a different atmosphere. Instead, there were people in jeans and T-shirts, ball caps, and sandals. The actual furniture was old and uncomfortable, and the noise from the bar overwhelmed. With so many excellent places to eat steak in Dallas, this isn't one of them. Super friendly service and great atmosphere for sure. Not sure a hundred dollar steak will ever be for me. And I’m comfortable with NYC prices. if your looking for that one great meal and expense is not an issue then Knife is for you. 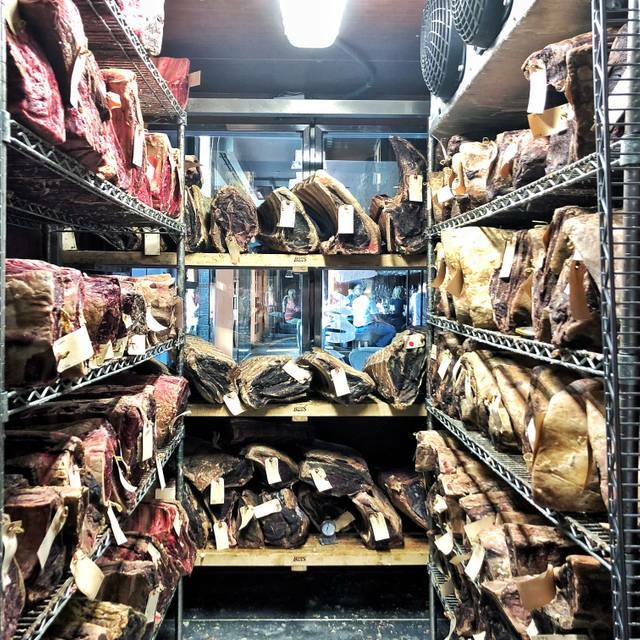 Knife vs your typical steak house is the additions - comprehensive cocktail list, aged beef with selections and the sides you tend to look for. You cant go wrong with the pasta or fish as well. We went to Knife for a dinner while we were in Dallas and every single thing we ordered was amazing. The server had wonderful suggestions and we really enjoyed sitting at the counter and watching the chefs at work. I highly reccommend this place for an upscale steak dinner. The atmosphere was terrible. For the food served and what it cost, I expect something other than worn down Formica tables. Drove in to Dallas specifically to have dinner at Knife for the first time. Was worth the drive, will make the drive again. Excellent experience! Knowledgeable and kind staff, delicious steaks, and fun delicious unexpected treats from the kitchen like crudités for a free appetizer, and orange muffins to take home with us. The food took over a hour to come out and I ordered the lamb medium and it came out practically rare I had to return it for another 10 minutes and by then I wasn’t hungry anymore. The service was really poor! The waiter was super-busy and couldn't really pay much attention. He forgot to order our appetizers and we waited for a while and had to remind him. He waived the price for the appetizers. He also never came and checked with us during dinner. The food, however, was very good. The ambiance was ok; it felt cramped and was quite noisy. Overall, the value was not good for the money we spent!